HD Video Security allows you to view your property anywhere, anytime with the highest clarity and definition on the market. Live view and playback capabilities remotely. IP Cameras, HD over Coaxial Cable, Wireless HD Cameras, Security Grade Hard Drives and 3 to 5 year warranties. 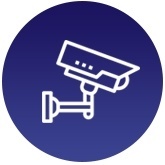 Pro Video Security offers video surveillance systems across Chicago, Skokie, Elk Grove Village, Evanston, Wheeling, and Morton Grove, Illinois.